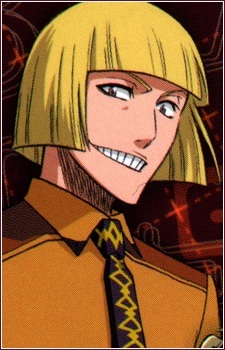 Shinji Hirako is the former captain of the 5th Division, preceding his lieutenant Sōsuke Aizen. He distrusted Aizen from the day they met, and thus made him lieutenant so he could keep an eye on him. Because Shinji never socialized with Aizen, however, he was easily deceived by Aizen's actions, culminating to his conversion into a hollow. Shinji's character is somewhat comical, adding a bit of levity to situations that are otherwise serious. He seems to like annoying his associate, Hiyori Sarugaki, which usually earns him a slap from one of her sandals. He also appears to have a history of referring to cute girls he meets as his 'first love', complete with a deadpan look on his face despite the obvious lie (he apparently never did this with Hiyori, further annoying her). An early design of Shinji can be seen in the first chapter's cover art, making it clear he was planned well before his introduction. During several points in the anime, Shinji's outfit is depicted to look like Lupin the III, likely as a homage on the part of the animators. Shinji's hollow mask resembles a pharaoh's mask. Shinji is quite skilled with his hollow powers, using a single cero blast to easily overwhelm Grimmjow Jeagerjaques. The video games also depict him being able to split the cero blasts into a pyramid shaped attack. Shinji's zanpakutō, Sakanade (逆撫) has the power of creating an inverted world. The power is an optical illusion which is caused by the scent the sword gives off upon its release. It inverts an opponent's sense of direction causing the directions of up and down, left and right as well as forward and backward becoming the opposite. It is not just the sense of direction that is changed; the opponent's eyesight and where they get cut is reversed as well. He has a tattoo on his tongue (seen in episode 142). After Aizen is defeated, Shinji resumes his former post as squad 5 captain.